One night when I was in college, I took my friend Austin to a birthday dinner at Fez in Philly. We had absolutely no idea what we were getting into when we entered the tented room. We ordered the set 8-course meal- and were like amazed by each course– so many new flavors. One dish was particularly memorable– a lamb pie, wrapped in phyllo dough and covered w. cinnamon and powdered sugar– which we destroyed ripping apart w. our hands. Obviously, this memory stuck for me– but not so much for Austin- who when I mentioned I wanted make the dish– had no idea what I was talking about… so, thanks man. 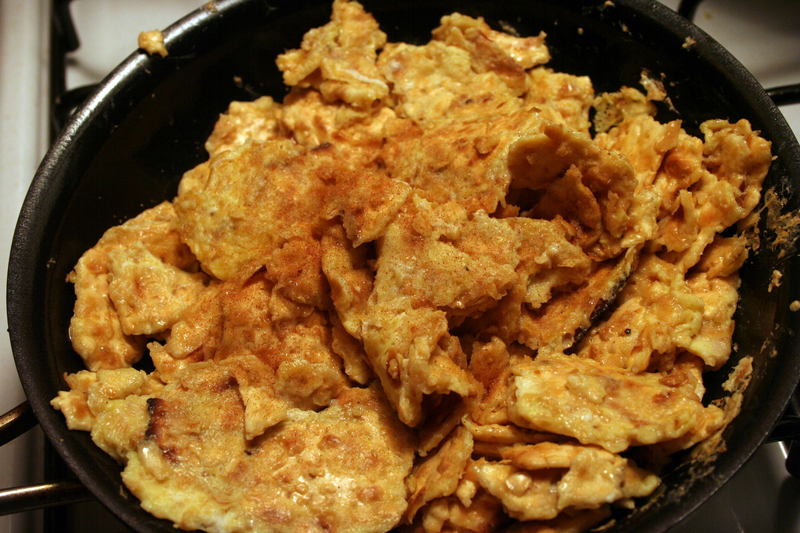 Anyway, it took a bit of research to find what this dish might be called- and to find a recipe. I finally figured it is called B’Stilla- and all the recipes I could find were for chicken b’stilla. I took on of those chicken b’stilla recipes from Epicurious (Gourmet August 1994, ) and doctored it- so I could best recreate the dish I remembered. Yes, this dish is labor intensive- I did it over the course of two days- made the filling one- and assembled the pie the next. The most exciting part for me, was making my own spice blend. I bought the whole spice seeds etc- and used my coffee grinder to make this ral en hanout. Will definitely use the leftover spice in future dishes. And plus making my own spice blend made me feel legit. There are several separate parts to this recipe– but trust me– and ask Reed and Rachel- it was worth it. A note about phyllo dough- did not realize, you are supposed to take out of the freezer and move to the fridge overnight. I didn’t realize- moved to fridge only several hours in advance- but it worked out well. In a food processor or coffee grinder- grind fine almonds, granulated sugar, and cinnamon. Almond sugar may be made 1 day ahead and kept covered in a cool dark place. In a spice grinder or coffee grinder grind fine aniseed, fennel seeds, allspice berries, cardamom seeds, cloves, peppercorns, cinnamon stick, sesame seeds, coriander seeds, cuminseed, and red pepper flakes, In a small bowl stir together ground spice mixture, mace, ginger, and nutmeg until combine well. 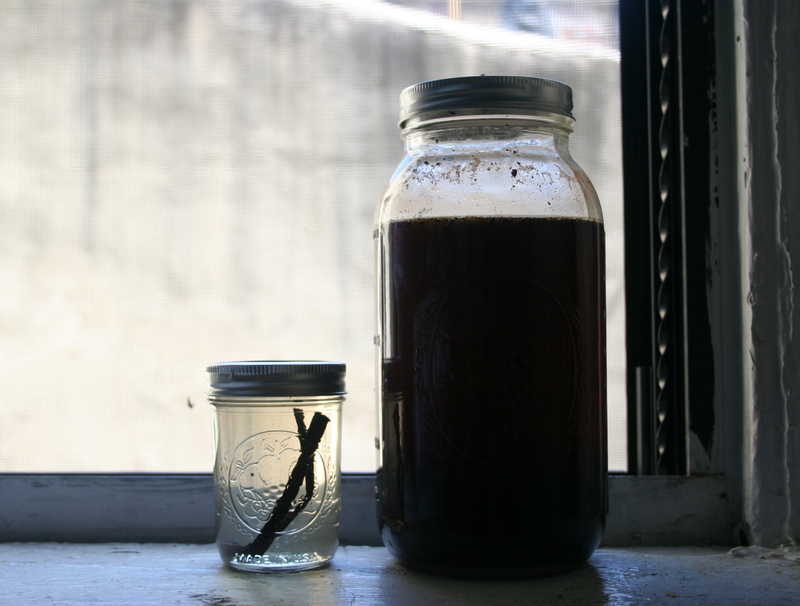 Ras el hanout may be stored in a tightly closed jar in a cool dark place up to 6 months. Makes about 1/4 cup. In a small bowl combine saffron with hot water and let stand 10 minutes. In a heavy pot saute onion and garlic in 3 tablespoons butter over moderately high heat, stirring occasionally, until onion is golden, about 4 minutes. Reduce heat to moderate and add ginger, ras el hanout, and pepper. Cook mixture, stirring, 3 minutes. Add lamb, broth, and saffron mixture. Bring to a boil, then lower heat and simmer, covered, for 25 to 30 minutes, stirring occasionally. Add raisins. Let lamb stand in cooking liquid off heat 30 minutes. Put lamb in colander and reserve cooking liquids. Return lamb to big pot. Measure reserved cooking liquid and solids- then put in a saucepan- you should have around 1 3/4 cup (i definitely had less than this). If you have more than that, you can boil and reduce to that. Reduce heat to moderate and add eggs in a stream, whisking. Cook mixture, stirring, until eggs are set, about 3 minutes. Remove pot from heat and pour egg mixture into a coarse sieve set over a bowl. Let mixture drain undisturbed 10 minutes before discarding liquid. Transfer egg mixture to a bowl. Add egg mixture, parsley, cilantro, lemon juice, and salt and pepper to taste and chill. Filling may be made 1 day ahead and kept chilled, covered. You want to work as quickly as you can here- so phyllo doesn’t dry out. So get everying in its place (mis en place) before you start. 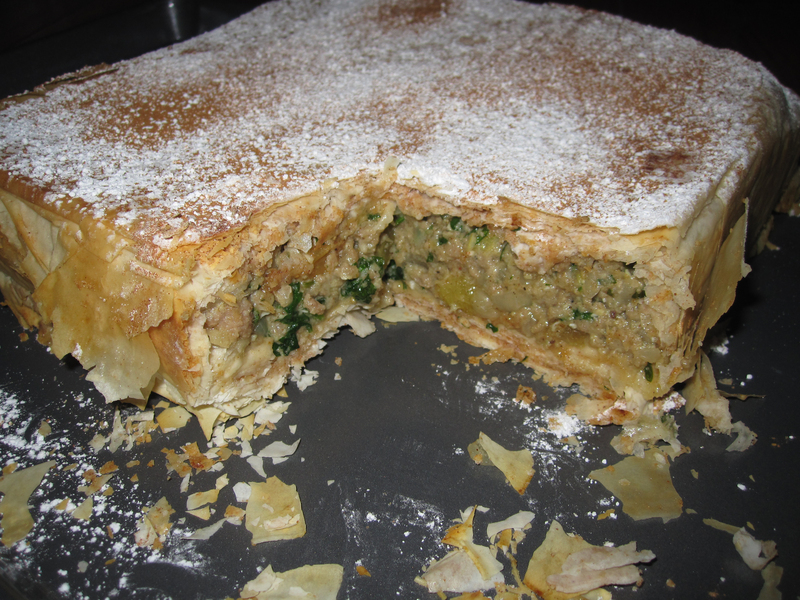 After you have opened the phyllo, put it in between two sheets of wax paper and put a slightly damp towel on top. I wanted filling to be room temperature- so I microwaved 1 minute. In a small saucepan melt 1 stick of butter and keep warm but not hot. Recipe says you can assemble 4 hours ahead of time and chill (but I feel like might as well assemble right before you bake). Bake b’stilla in oven until tops and ends are puffed and browned, 15 to 20 minutes. Cool b’stilla slightly on a rack. Flip out onto a serving dish. Generously sprinkle b’stilla with confectioners’ sugar and cinnamon and serve warm. The other day, I was in the elevator at work– and one of my co-workers, who also belongs to the co-op, made some comment about how filling wheat berries are. I chuckled and took it as typical co-op talk– but something about it stuck– and within the week I bought a huge bag of wheatberries (costing 83 cents, yup). Pretty soon, i’m that co-op hippie in the elevator- talking about the delicious and substantive qualities of wheatberries, surely deserving to be mocked. This salad is not too different from the Everything But The Salad– and is equally infinitely modifiable. I made this two ways- a meat and a veg version. Ingredients might seem a little random- but it is basically whatever I have in the cabinet/freezer. 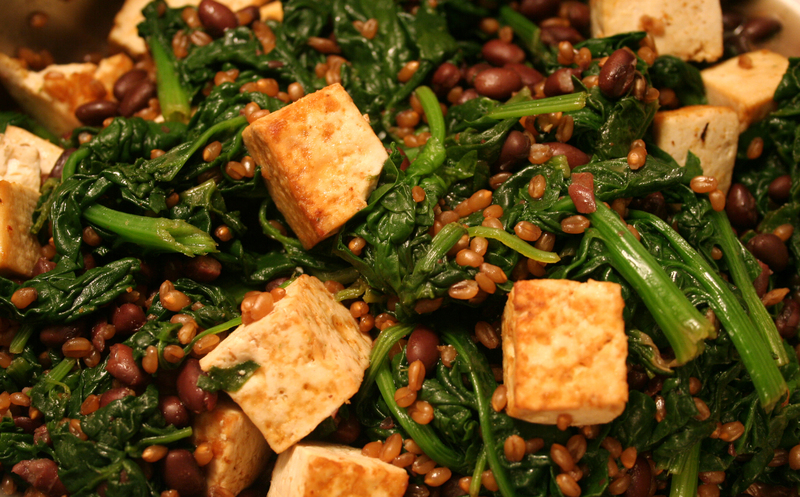 The veg features a chipotle baked tofu, spinach and black beans. The meat has duck, chorizo and kidney beans. I sort of winged it on these recipes- so forgive me for the imprecise manner- and just ask me if you need anything clarified. How to prepare wheatberries: A lot of people talk about soaking these overnight, but this does not really prove to be necessary. Take firm tofu and place on a plate. Put another plate on top of it- and put a very heavy book on it. Leave for 30 mins. This will drain out some of the water. It is not an altogether necessary step- but if you have the time- it does make a difference. Cook wheatberries. Cut tofu into 1 inch cubes and place in an 8×8 inch baking dish. Mix some olive oil, half a lemon or lime, salt and pepper in a little bowl. Pour over tofu. Take a spoon of the chipotle sauce- pour over the tofu and mix up. This stuff is pretty spicy- so use more or less accordingly. Bake at 400 for 30 mins. Best Baked Tofu would work here too. Drain beans in colander. Sprinkle w salt & pepper and a pinch of cumin- tiny pinch cayanne. Mix up. Wash spinach. Put wet spinach into a big pot. Add some water- maybe half a cup. Turn on the heat, put on a lid, and stir occassionally and the spinach will wilt in a couple minutes. Drain spinach. Add beans, and wheat berries to spinach. Season with lime or lemon, salt and pepper. Add tofu. I think a red pepper would work really nicely in here too, if you have it. Cook the cup of wheatberries per instructions above. Drain, then add salt, pepper, a splash of balsamic vinegar and a touch of olive oil. Later, I am going to add some duck fat- but if you are not into that- add little more olive oil here. Drain can of kidney beans. Sprinkle with salt, pepper and paprika. Slice up chorizo and fry in dry pan. Take out of pan and set aside. Wash and pat dry. It will have a massive layer of fat on top. Make knife cuts into this fat, diagonal, quarter inch apart. Make another set in the other direction, like a crosshatch. Salt & pepper. Heat dry skillet on low. Don’t add oil (but because I am indulgent, I left the chorizo fat in this time). Put fat side down in skillet. Will begin to brown and fat seep out, 10-15 mins. Flip over and cook another 5 minutes. That’s medium rare. Pretty interesting, apparently duck is a red meat- so you cook it medium rare etc- instead of like poultry which you cook through. Want it more well done, cook on the longer side of the 10-15 mins. Take out of pan, wrap in foil and let rest for 15 mins. To eat, I usually cut off the massive fat layer- though one might consider this poor practice- then slice the breast on the diagnoal. I have had crispy bits of duck fat on a salad before- and it was delicious- can’t remember the proper name for it. Add beans, duck and chorizo to wheatberry salad. Here is where I got a bit decadent again- and drizzled a spoonful of duck/chorizo fat that remained in the pan out over the salad. This cake is simple, gorgeous and easy to make. Perfect for a weekend at Mrs. Weiner’s (yes, another post from that very productive wknd!) I’d say the cake is somewhere between a yellow cake and a sponge cake- would you agree Rach & Reed? My mother used to buy something like this for passover- so I nostalgically spent a while looking for it- or a similar recipe. 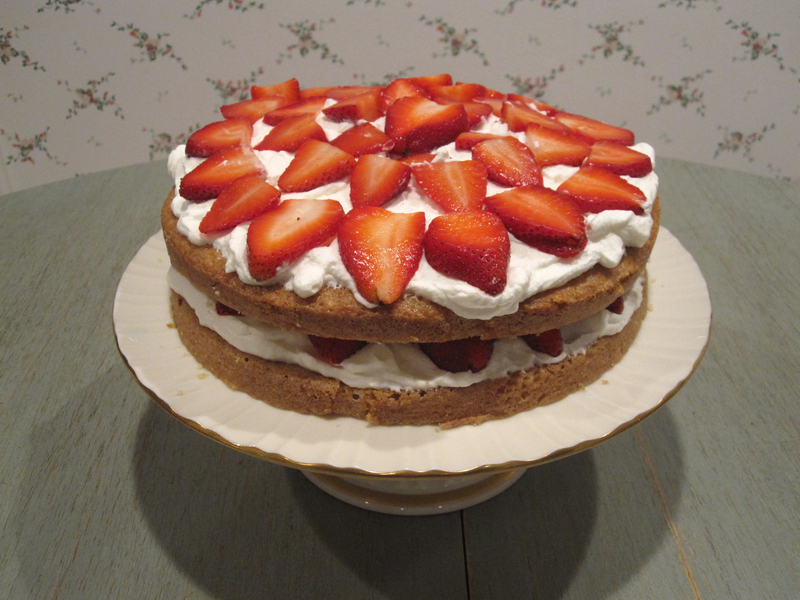 But my search for strawberry shortcake gave me lots of biscuit type recipes– until this, which I finally found in the place I should have looked first– but under a different name: Ina’s Strawberry Country Cake. This recipe makes two cakes- but only uses one- which you cut in half. Can freeze the other cake- or save it for your book group ;). Don’t be intimidated by slicing a cake in half, as I was, just take a long serrated bread knife and sort of going around the cake, making a shallow cut, then go back over and cut further into the cake- does that make sense? Reed showed me how– but I’m sure there are lots of demo videos online–I noticed our friend Jamie (we all know i refer to cooking channel people as if i know them) has one on his website. This recipe is not kosher for passover, but I feel like it could be with some matzoh meal/potato starch substitutions- or could at least give you ideas on how to jazz up your kosher cake. This is my new comfort food. Takes about 5 minutes to make. Such a simple idea- but I never would have thought of it. Until, I can’t quite remember how, I came upon a 2006 NY Times recipe for poached scrambled eggs and egg & rice soup. I was intrigued, but fyi just scrambled eggs poached in water are not so flavorful. And recently, Bittman wrote about this egg drop variation in his NY Times soup matrix. This recipe can be varied as you wish. 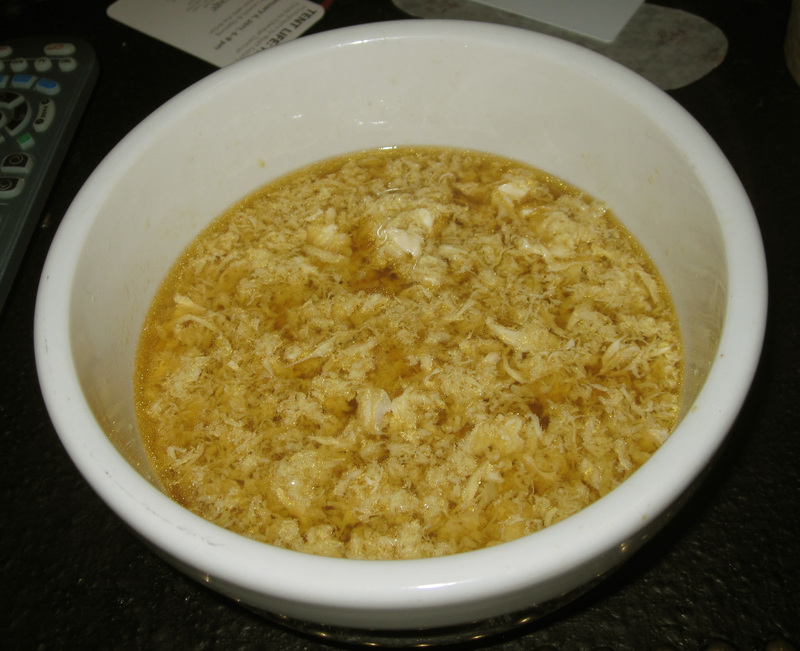 I really like it without the sesame oil and soy sauce too- and I call that Chicken & Egg soup. And have added rice to that. Great w. sriracha (thai hot sauce). optional: soy sauce, sesame oil, scallions, sriracha, rice, chicken etc. Bring stock to a boil in saucepan. Beat eggs well in a little bowl. Lower heat to a simmer. Use fork to create a whirlpool in broth. Pour eggs into center of whirlpool and keep whirling around for 1 to 2 minutes. Eggs will be light and cooked- and delicious. I have made the mistake of adding too much soy sauce and sesame oil- which has a very strong flavor. So maybe start w. a teaspoon of soy sauce and half a teaspoon sesame oil and add more to taste. Add salt & pepper to taste. This picture is not gorgeous- but believe me, the dish is. I mean, bacon, apple and balsamic- what a delightful combination. I used to have a crush on Jamie Oliver, back when he was just the Naked Chef. Before he named his kids– no joke– Poppy Honey Rosie, Daisey Boo Pamela, Petal Blossom Rainbow, and Buddy Bear Maurice Oliver. Seriously, not joking. He also has like a million tv shows– which have gotten a bit ridiculous. He is like– oh here i am, in my backyard with my $20,000 wood oven- la-di-da. Or like, I saw him literally prepare a whole dinner w. his pocket knife– like why? what are you trying to prove? just use an actual knife. But the best take on Jamie Oliver is the South Park episode in which they spoof all the food network stars- thanks Jenna for sharing that one. Youtube/hulu/whatever it. I feel like Jamie’s recipes don’t always work out the way they are supposed- because he can be pretty willy nilly about measurements- so for the recipe I have translated Jamie speak. Pour a good lug [couple tablespoons] of olive oil into a saucepan, get it hot and add the bacon and fennel seeds. Cook until golden then add the onion and continue to cook, with the lid on, for a few more minutes until golden and sticky. 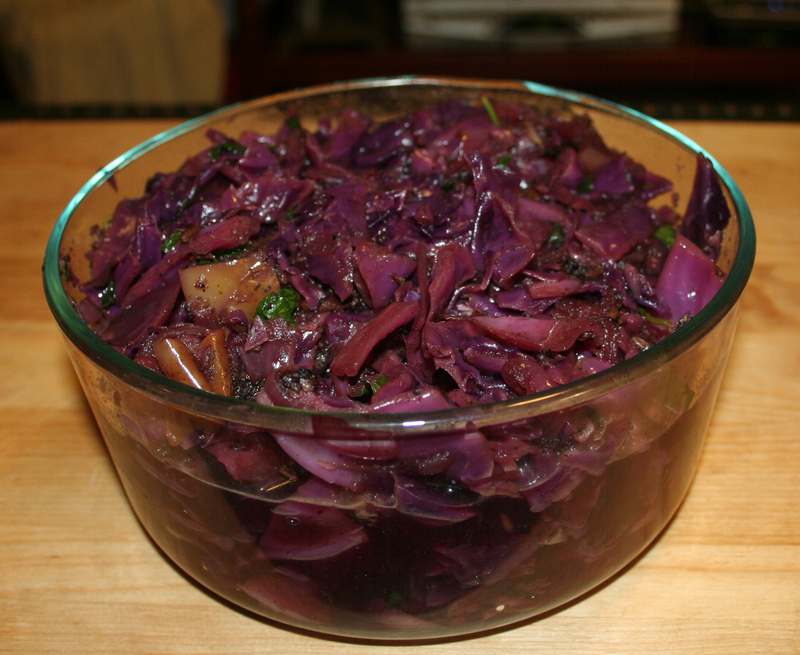 Add the apple, followed by the cabbage chunks, salt and pepper and the vinegar, and stir everything together well. Put the lid back on and continue to cook on a low heat for an hour, checking and stirring every so often. You will get- as Jamie says- a gorgeous sticky-sweet cabbage dish. Put in serving dish, top with butter and a sprinkle of parsley.